This isn't the way that Barnes & Noble (BKS) would have chosen to write its final chapters. Watching its rival Borders liquidate this summer should have been its opportunity to grab market share, just as the cavernous book-selling superstore has benefited when smaller bookstores have had to board up and move on. Rolling with the times by putting out a proprietary e-reader should have kept Barnes & Noble relevant, but a margin-slashing price war is exposing the retailer's financial shortcomings. Times have changed, and Barnes & Noble can't go back and relive its glory years. Barnes & Noble is coming off another dreadful quarter. Back out the Nook and its digital downloads and you'll find that sales actually fell by 11% at its superstores and college bookstores. 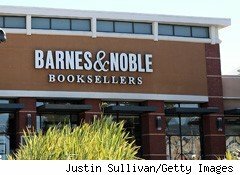 Unlike Amazon.com (AMZN), which is routinely profitable throughout the year, Barnes & Noble posted a wider-than-expected deficit. Coming up short has been a recurring theme for Barnes & Noble. The struggling retailer has missed Wall Street's profit targets in each of the past six quarters, with five of those periods resulting in larger-than-forecasted losses. Analysts see Barnes & Noble posting a loss for all of fiscal 2012. They see a return to profitability come fiscal 2013, but we've seen how the prognosticators have overshot the chain's reality in the past. We're now heading into the seasonally potent part of the year for Barnes & Noble, but how many holiday shoppers do you really think will be crowding the registers when they know that books and gifts can be bought cheaper online? Besides, now that so many people own a Kindle -- and to a lesser extent a Nook -- why insult gift recipients with an actual hardcover book? There's no denying that digital delivery is the future of media. We saw it happen with music, and now most of the record stores have closed down. We are seeing it happen with movies, as streaming and downloads replace physical DVD purchases. Video games are also being dished out by server farms to Xbox Live users and smartphone owners. Why will physical books survive? Folks who love the smell of a new book or the sound of a page turning will want to check with musical purists who miss the grooves of vinyl or the shiny allure of compact discs. Progress is inevitable. Every quarter finds millions of bibliophiles making the switch to e-readers, and the migration continues as hardware prices continue to drop. This doesn't mean that books will go completely obsolete. We may never see a world where everyone owns an e-reader or tablet. However, the demand for gargantuan dedicated bookstores will dry up -- and with that, Barnes & Noble's livelihood. Pollyannas will argue that Barnes & Noble gets it. Unlike Borders, which begrudgingly warmed up to the more obscure Kobo reader, the superstore still standing has sacrificed its fragile balance sheet to make one final wager on the Nook. Barnes & Noble is in a lose-lose situation. If it slashes its prices to remain competitive, margins will get even worse. If it doesn't respond, it's back to relying on its fading superstores for a slower death. I'm sorry, Barnes & Noble. Every page I turn leads to Chapter 11. Longtime Motley Fool contributor Rick Munarriz does not own shares in any of the stocks in this article. Motley Fool newsletter services have recommended buying shares of Amazon.com.